Langham Hall in Langham, near Blakeney, Norfolk sleeps 16 people. Langham Hall near Blakeney sleeps up to 20, this lovely hall offers the perfect venue for a big family get together and celebration. A large walled garden is ideal for letting children and pets alike run around while you sit back on the terrace or relax in the hot tub outside the orangery. Most rooms have a large wall mounted TV to enjoy, whilst the cellar is ideal for a children’s den with bunk beds, bean bags and a 70 TV on the wall for gaming or or enjoying films away from everyone else. The award winning gastro pub in the village can arrange to send a personal chef to cook your evening meals or even breakfast if required (by direct arrangement with the pub), or instead you can stroll down the lane to enjoy refreshments there. This part of North Norfolk has something for everyone with Blakeney just a mile away or Wells-next-the-Sea just a little further. Take a lovely walk along sandy beaches, visit nearby nature reserves or travel along the coast to the traditional seaside resort of Hunstanton for a family day out. The beach is 10 miles from Langham Hall near Blakeney. With the shop 1 mile, and the pub & restaurant are 200 yards from Langham Hall. Bedroom 1: With 2 sets of bunk beds and 70 Freeview TV. Living room 1: With wood burner and 70 Freeview TV. Living room 2: With open fire. Dining room: With 42 Freeview TV. Kitchen: With breakfast area, electric range, microwave, fridge, freezer, dishwasher, 42 Freeview TV and tiled floor. Bedroom 4: With four-poster king-size bed, twin beds, 42 Freeview TV, and en-suite with shower cubicle and toilet (Jack and Jill shared with bedroom 5). Bedroom 5: With four-poster king-size bed and 42 Freeview TV. Bedroom 6: With four-poster super king-size bed, twin beds, 55 Freeview TV, bath and en-suite with shower cubicle and toilet. Bedroom 7: With double bed, 42 Freeview TV and en-suite with shower cubicle and toilet. Please note: Maximum occupancy 16 (including children). Oil central heating, electricity, bed linen, towels, Wi-Fi and logs for open fire and wood burner included. Travel cot and highchair. Welcome pack. 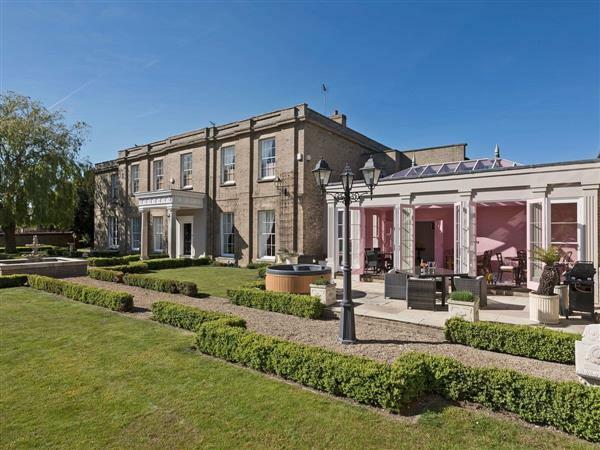 Enclosed 1-acre lawned garden with patio, terrace, garden furniture and barbecue. Hot tub for 10 (private). Bike store. Private parking for 20 cars. No smoking. Please note: There are 3 steps in the garden and an unfenced pond with fountain 5 yards away. 5m Holidays at Langham Hall run from Friday to Friday. Pets allowed at Langham Hall. For a better idea of where Langham Hall is, you can see Langham Hall on the map below. Langham Hall is in Norfolk; should you be on the lookout for a special offer, you can find all the special offers in Norfolk. It's always worth checking to see what is on offer at the moment. Do you want to holiday near Langham Hall (UK11163), you can see other cottages within 25 miles of Langham Hall; have a look to find your perfect holiday location.